Got Good Hair? We do! We run until feet bleed, ride trains from the Bronx to Coney Island, watch the sun rise, leave words on granite, find purpose in the music, yell for the gloaming, grow in numbers as the hours pass, push back fate, search for god in the traffic lights, save self, smoke life on the Brooklyn Bridge, jump off the Empire State building, lay down on Broadway, wear noise pollution like headphones, hold her heart in our pockets, dot her eyes, cross her streets, when the city sleeps we will be watching. Here’s the voice of the new Nuyorican, the poetic tales of Rican life at the millennium. Bonafide is rooted in those familiar old mean streets of El South Bronx y El Barrio; he tells and retells the daily rituals of the hood then and now, drugs and dominoes, police brutality and graffiti immortality, Sandra María Esteves cultural ceremonies and Pedro Pietri life-in-death obituaries. What makes him Bonafide is that he celebrates all parts of his quirky self, his long hippie hair and love for rock and roll, his adoration of Che and Julia de Burgos and Neruda and Baraka, Sonia Sanchez, Gandhi and Jimi Hendrix. In Pelo Bueno, we see the invisible and hear the silenced and the mute. Here, for a change, naps and kinks and ‘fros, braids and cornrows is not pelo malo. That’s good hair, rich, full, sculpted pelo bueno. The blade-edged gospel of the city, in the deft and capable clutches of Bonafide, jolts and transports the congregation. This is no typical urban griot spewing worn rhythms. Bonafide sizzles with unflinching focus, and crafts uncommon stanzas using a language that virtually burns with his signature. There is no voice like this. Pelo Bueno demonstrates that while many in the poetry and spoken word canon would be content with poems that only speak to their egos, Rojas chooses to personalize issues of oppression and cultural preservation. His dialectic focuses on several themes—the immigrant experience in America, tales of wasted talent in an Andy Warhol Era, and visions of war in faraway lands. Through his use of language, the rhythms of Hip-Hop and Rock & Roll speak with a Bronx Boogie attitude that reflects his Nuyorican roots. A child of the Puerto Rican Diaspora transplanted to the streets of Nueva Yol, Mr. Rojas uses his words as blades, cutting through the absurdity and deceit that often plague our judgment. Nuyorican poet Bonafide Rojas follows in the tradition of Julia De Burgos, Clemente Soto Velez, Pedro Pietri, Victor Hernandez Cruz, Tato Laviera, and the many others who have pushed a Puerto Rican literary canon. His work can be found in Bum Rush the Page: a Def Poetry Jam (Three Rivers Press, 2002), Role Call: A Generational Anthology of Social and Political Black Literature and Art (Third World Press, 2002), The “Centro Journal,” an academic publication of The Center for Puerto Rican Studies (Hunter College, 2001) focusing on the next generation of Nuyorican poets, Blu Magazine’s “Puerto Rican Issue – Roots and Culture”, and Freedom to Speak, the first anthology by Poetry Slam, Incorporated. 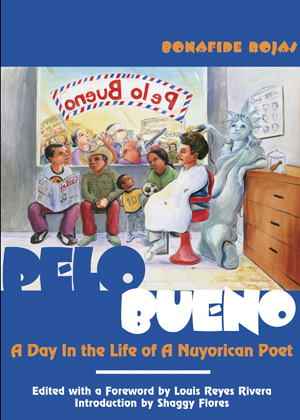 Pelo Bueno, through poems like Creed of a Graffiti Writer, Invisible Ones, and 25 Years In, lets the reader see the maturity of a Latino writer spitting in the wind, his Nommo creating poems that resurrect ancestors and endorse empowerment. 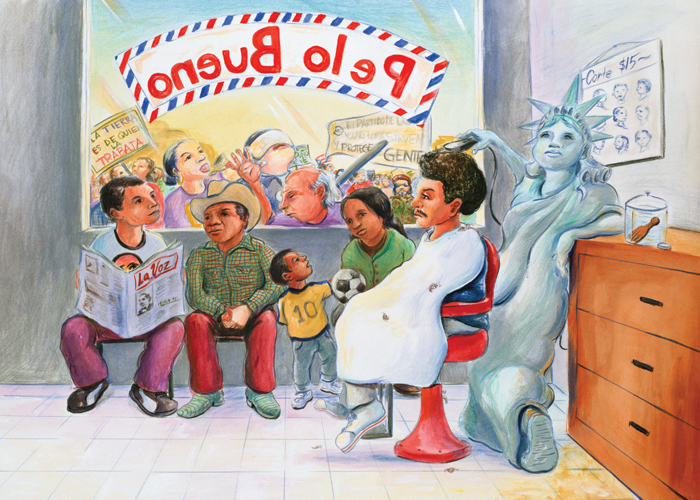 The book features artwork by fronterizo artist Francisco Enrique Delgado, an introduction by African Diaspora Scholar & Writer Louis Reyes Rivera, and an introduction by famed publisher and Nuyorican poet Shaggy Flores. Famed Nuyorican poet Bonafide Rojas, a native of The Bronx, NYC, is a new generation Nuyorican poet/musician/photographer/teacher who is at the forefront of the current Latino literary renaissance. He was the 2002 SLAM THIS! Poetry champion and was also a member of the 2002 NYC | Union Square Slam team and the 2003 Chicago Wicker Park Slam team. He has worked with Teachers and Writers (NY), ASPIRA of NY (NY), ENLACE (NY), Muevete! 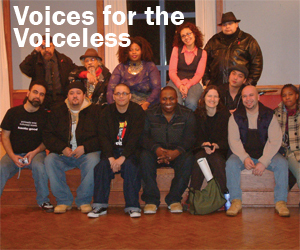 (NY), Youth Speaks (CA), the Guild Complex (IL), Young Chicago Authors (IL), and the Louder Arts Collective (NY).